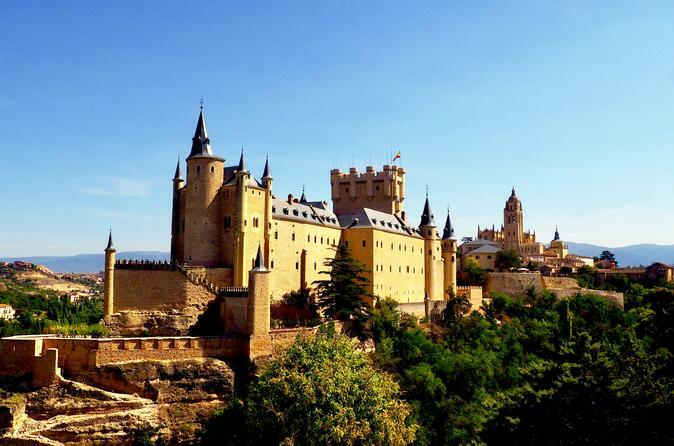 Live an unforgettable experience visiting the amazing town of Segovia and its three most important monuments: the Aqueduct, the Cathedral and the Alcazar. We previously visit a winery with very good wines and have lunch in a very good restaurant. Segovia is an amazing town. It is unbelievable that such a small city could have 3 monuments that, any of them would be worth to be visited alone. It has been considered a city world heritage. First. The Roman Aqueduct. A work from 2000 years ago that still stands as the first day. We are happy if a visitor tells us he does not have a concrete image of what he is going to find. He is the one to enjoy more in the tour. It allows us to act as if we were like David Copperfield making our visitors to have an impresion that maybe they will never forget in the rest of their lives. We consider the building of the Aqueduct 2000 years ago a more impresive work that what man did in 1969 getting to the Moon. We try to make our visitors see how the ancient inhabitants of that area would feel when they saw that the Romans were building that authentic jewel. And you get into this town crossing those arches and meet a town out of a dream. Much of it dedicated to being visited on foot in which each stone oozes history. Spain and Segovia are the unrepeatable consequence of their peculiar history, with influences of all those who passed through these lands. Ancient Iberians, Romans, Visigoths, Arabs, Jews, French. They all left their mark there. And we, Spaniards are very proud about it. After having visited the Aqueduct you might think that there is nothing more to see but when you come across the Cathedral you find it unique. You see it during the day, at night, on the outside, inside. And no matter how you look at, you fall in love with it. But there is even more. There is an amazing castle, the Alcazar. It is so formidable that Walt Disney himself was inspired to design the Castle that appears in Snow White and 7 Dwarfs. In few words a fairy tale Castle. Wine will also be with us during our visit to Segovia. We strongly believe that everything is much nicer with a glass of wine in hand. Why should you come with us to this tour? Because of Segovia? The winery? Wines? Lunch? A combination of all that. One thing we know is that we are going to make our best to make you have an unforgettable experience. That is what we have been doing for years and that is what we are going to be doing in our next tour. Come with us.